Get your little turkeys up and movin' as they review ANYTHING you want them to! This freebie is from my set of D.I.Y. Brain Breaks. Just type on the slides, save it as a new name (that way you can use it over and over again), and display the powerpoint for your class. They will LOVE the chance to be active in the classroom. You could use this for letter/number recognition, days of the week, skip counting, spelling, sight words, math facts, colors, shapes, fractions...the options are endless! 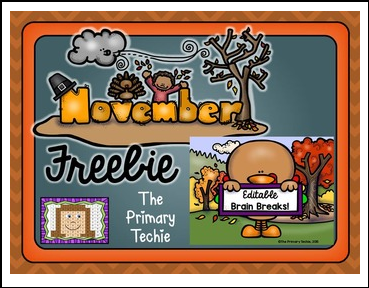 If you like this freebie, be sure to check out the full set of Editable Brain Breaks to use all year! You do NOT need a smartboard to use this program. Any computer with a projector will work well.